I wanted a water feature but was unsure of the plants, this was reccommended and I love it! Watercress Sprout- Nasturtium officinale. Watercress is a relative of the mustard green and is native to Europe. They fully grow in just five days and prefer moist, wet environments, such as along the banks of a river. You may also need liquid fertilizer to ensure they get all the nutrients they need if you grow them indoors. Their cultivation dates back to the Ancient Greeks, who used it as an alternative to black pepper. It was also used as a remedy for a variety of illnesses, including kidney stones, ulcers, acne, and even headaches. In modern times, it is also thought to help treat cancer and hypothyroidism. Do you need color to add to your water garden? 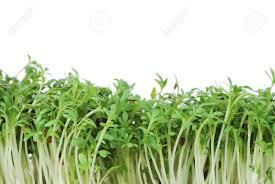 Watercress Sprouts are a great water plant to have in your water garden. A plant like this is also a great plant to use for preventing soil erosion. This flower offers a great scent and some great detail for around your pond or water feature. Also, this resembles a ground cover of the aquatic plants. If you have a garden space that tends to flood or remains damp with slow-moving water, then the watercress (Brassicaceae family) might be ideal. This plant group includes mustard, radish, and wasabi. These are known for having a piquant (pepper) flavor and are great for seasoning.This is a very adaptable plant with a greenish color. It has a long hollow stem, allowing the top of the leaves to partially float. Watercress Sprout will grow white and green flowers during blossoming. Due to its adaptability, this beautiful edible plant is quite popular. There are many ways for you to grow this in your garden. And, since it grows quickly, you can harvest it at different times of the year.You can choose a spring or fall harvest. The peak flavor is in the spring. About three weeks after the seedlings start growing, you can harvest them. Trim back the spring harvest during the summer, and you will find new growth. Cut off the flower stalks, and you will get more leaves during the autumn harvest. The best peppery flavors can be achieved with temperatures below 85 degrees Fahrenheit.